Yap, FSM—On August 11th, a groundbreaking ceremony took place on Falalop, Ulithi Atoll, Yap, celebrating the arrival of 12 Seabees from the U.S. Navy, led by U.S. Army Captain Colin Westlake. The Sailors - made up of electricians, builders, plumbers and other specialists - recently arrived in Falalop to lend a hand as part of USAID's Typhoon Maysak Reconstruction Project. According to LTJG James Wilson, the Seabee liaison officer in Micronesia, "This operation has been a year in the making. Coordinating between government agencies was a challenge but one that was worth the effort. 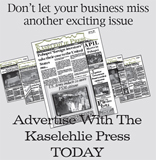 The Seabees are now in Ulithi directly impacting a community with such a rich naval history." Deputy Chief of Mission Joanne Cummings elaborated. “The U.S. commitment to the FSM is very broad – in humanitarian response as well as education, health, infrastructure, and many other areas. 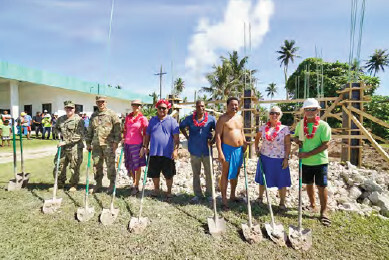 We are pleased to see the Seabees here in Ulithi, helping these communities complete their reconstruction and demonstrating the strength of our bond with Micronesia,” she said. The Seabees hit the ground running, and have already made significant headway on their current project, a shade structure adjacent to the airport in Falalop. Next they will tackle two additional buildings on the island - one cultural center for girls and one for boys. 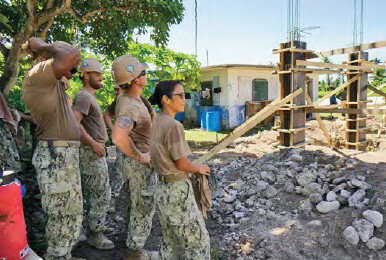 The Seabees are constructing everything from the ground up, working in close cooperation with the U.S. Embassy, USAID, Pacific Fleet, Pacific Command (PACOM), 30th Naval Construction Regiment, the International Organization for Migration, and the community of Falalop. A brief ceremony was held at Outer Islands High School, with representation from the U.S. Embassy, USAID, Yap State government, IOM and traditional leaders. Several of the speakers highlighted the unique relationship between the Ulithi Atoll and the U.S. Navy. The Seabees first arrived in 1944 during World War II, when the Ulithi Atoll became the primary naval base of the U.S. in the Western Pacific. Over 70 years later, the Seabees have maintained strong ties with Ulithi and the Federated States of Micronesia. "We remember that Seabees 'Can Do' from the old times...what I'm saying is from the heart. 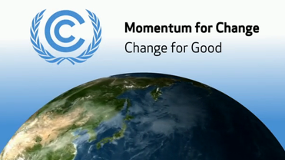 We will get Ulithi back from Typhoon Maysak."